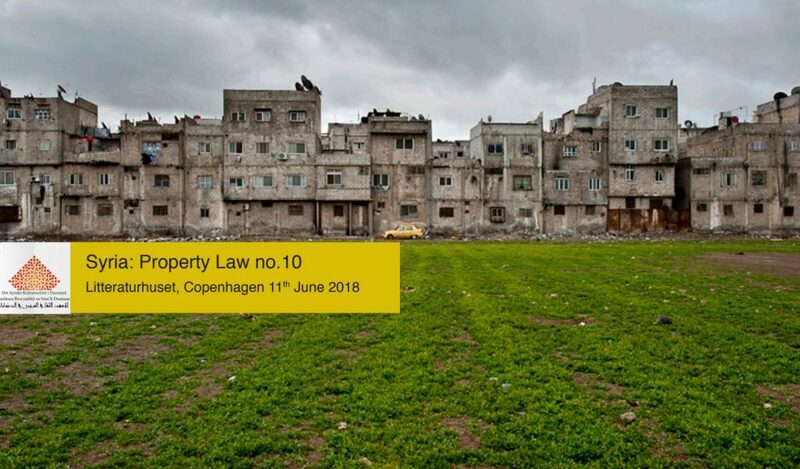 Det Syriske Kulturinstitut afholdt d. 11.6.2018 en kulturcafé om Property Law no. 10 i Syrien. Nedenfor finder du en beskrivelse af aftenen samt programmet. Syrbanism is an urban Syrian network founded in 2017 to support oppressed Syrian residents against urban injustices. Syrbanism is a participatory platform that focuses on investigating the political, social and economic aspects of the urban discourses in Syria. Syrbanism is a knowledge exchange lab that bridges the gap between international and local urbanists who are working on Syria. Syrbanism is a potential initiative that embraces urban dialogues in Syria. Edwar is a Syrian architect based out of Vienna, passionate about development through the lens of urban design. He is a Chevening Alumni and Holds an a Diploma degree in Architecture from Damascus University and an MSc in Urban Design & Development from University College London (UCL-UK). Edwar is the MENA project manager for the Communication for Development (C4D) Network. He is also a member of the ‘Diaspora Network Alliance’ (DNA) with 30 other Syrian professionals from EU countries to establish a space to advocate Syrians’ rights. Edwar co-founded Syrbanism in 2017. Nour is a Syrian architect and urban researcher based out of Berlin, specialised in social justice, informality, and spatial changes during conflicts. She is DAAD Alumna and holds a Diploma degree in Architecture from Damascus University, and an MSc in Urban Design from TU-Berlin. Nour is an architect at Carpaneto.Schoeningh architekten in Berlin, an innovative office dealing with new approaches of designing housing projects. Previously she worked at Damascus University as a research and teaching assistant. Nour co-founded Syrbanism in 2017. Edwar and Nour will talk about the property law no. 10 in Syria and they will answer questions from the audience.